The following chart is from The Technical Take and illustrates how bearish market timers have become. The entire article is worth a read. That has likely been "fixed" thing morning. Can they trade intraday there? If so then the hobby bears (which they prove themselves to be, as contrarian indicators) no doubt crapped their pants a couple times today. We'll see what sentiment does after today, but I think we see quite a bit more downside before a significant bounce. They usually don't move so quickly. This correction is over 3 weeks old and it took them until now to go from bullish to bearish. Which numbers do you use that correlate with this chart? 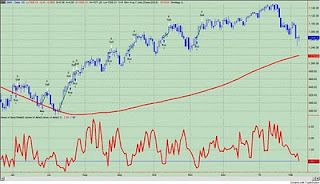 Sentimentrader.com has some charts that he updates every night. That is what I use for Rydex data. Unfortunately, I cant post the charts because it is a pay site. I think the Rydex website has the data and you could create the charts yourself. Do you know if the plotted indicator is a moing average or just raw data? If it's a moving average how many days? I believe its plotted. The chart I posted is the assets in leveraged bull funds vs. assets in leveraged bear funds.